For example, last Saturday night I was at his place and he had been working a side job that morning. I saw that he was still in his work clothes as if he had just gotten home, and asked “Gee, did you have to work all day long?” not being nosey, understand, but just that it was unusual for a Saturday. He replied, “Yep.” blandly and said nothing more. The next day he told me, “I spent hours yesterday afternoon over at George’s house talking to him about all his problems…” so of course I knew he hadn’t worked all day, but why did he tell me he had? It was no big deal, but he is always doing things like that, for example saying he went one place when he went another. Like I said, these things are just “white” lies, but they make a person wonder. I have gotten to where I just assume I am not being told the whole story all the time, because the little white lies really make you wonder… and it also has a tendency to make you feel insecure. Which puts him in control. Darn! So, can such things be a power struggle? I have heard that relationships go through three phases, initial rush of love, then disillusionment and power struggles, then mature love – provided they make it. Phase 1: the dream of what love could be (based on zero history with this new other person, i.e. no real data gives you total space to project your fantasy, right?). Phase 2: the reality of two people’s mutual self-limiting patterns and unresolved past wounds that surface as a part of the friction of two real-life partners trying to relate under real-world conditions (the data begins to emerge, the fantasy begins to be seen as illusion). Phase 3: the hoped-for working through of these obstacles and impediments to true intimacy (mature love emerges, with skillful mastery of working with any ongoing love-friction)…. you are now at a place where you can see lasting love in the real-world, and have a time-tested track record with overcoming challenges and building love-strength. IMPORTANT NOTE: both partners go through all three phases. This means neither partner is immune to having self-limiting patterns and unresolved past wounds that adversely affect intimate possibilities as dreamed in Phase 1. Both partners need to deal with their own stuff, to vigorously self-confront themselves as to the part they play in making Phase 2 as miserable as it is. And, finally, to get to Phase 3, both partners need to take 100% responsibility for the state of the relationship and commit 100% to their own personal growth as priority #1 in their lives (the relationship itself might be #2). Phase 2 includes power struggles, polarities, defensiveness, unresolved past history, projections, and a list as long as your arm of other psychodynamic patterns that when all added up, basically prevent the free-flow of love and the growth of authentic intimacy. Is “white lies” and “withholding love” included in the behavioral symptomology of this middle phase? You bet. Obviously Phase 3 would be characterized by authenticity, truth-telling (regardless of the risk), and clarity of communication (i.e., not that Phase 2 kind of truth-telling = “I feel you are a jerk!”, but a more clear Phase 3 type of truth-telling = “What you are doing does not work for me. You have the perfect right to do it. But here are the consequences in terms of my feelings…”). In the end, to get to Phase 3 you will not only need to see that you have partnership in the other person taking care of their end of the growth curve. You will need to jump in and do your own personal growth, confront your own part of the dance, and take real risks and make real emotional changes in yourself. 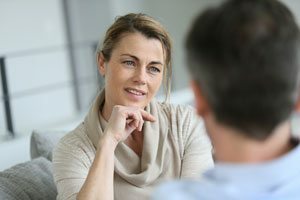 It is characteristic of Phase 2 to focus on what your partner’s negative patterns and deficits and needs for behavioral change are. It is characteristic of Phase 3 to focus on what your own negative patterns and deficits and needs for behavioral change are. So, in line with that tough assignment, as it were, my next question might be: What are YOU doing to keep this highly (and rightfully perceived) unsatisfactory pattern in place? What can YOU change about how YOU are in the situation that would most represent a dramatic step in personal growth for yourself — one that perhaps risks the relationship you currently find yourself in — but one which shows you are 100% committed to your own personal growth regardless of the risks.